Brighten and hydrate your skin with the Oh K! 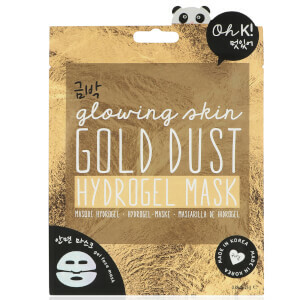 Gold Foil Sheet Mask, an intensely nourishing face mask infused with real Gold Extract to create a luminous radiance. 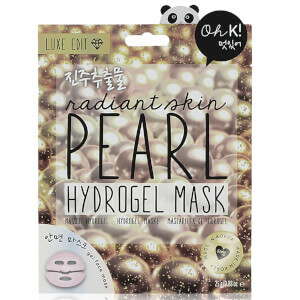 The luxurious treatment uses a fibre sheet mask for maximum absorption of ingredients, while a potent blend of Apple, Chamomile and Wild Cherry Extracts work to replenish powerful moisture to soothe and calm the skin. Expect a bright, fresh and visibly glowing complexion. Cleanse your face, then remove the mask from the packet and smooth over the facial contours. Leave for 10-20 minutes then peel off and use circular motions to massage the remaining formula into skin. No need to rinse. Aqua (Water, Eau), Dipropylene Glycol, Glycerin, Glycereth-26, Butylene Glycol, Paeonia Suffruticosa Root Extract, Centella Asiatica Extract, 1,2-Hexanediol, Chamomilla Recutita (Matricaria) Flower Extract, Glyceryl Caprylate, Ethylhexylglycerin, Portulaca Oleracea Extract, PEG-60 Hydrogenated Castor Oil, Ammonium Acryloyldimethyltaurate/VP Copolymer, Dimethicone, Carbomer, Tromethamine, Pyrus Malus (Apple) Fruit Extract, Prunus Serotina (Wild Cherry) Fruit Extract, Ethoxydiglycol, Cellulose Gum, Allantoin, Viola Tricolor Extract, Lavandula Angustifolia (Lavender) Flower Extract, Centaurea Cyanus Flower Extract, CI 77480 (Gold), Disodium EDTA, Parfum (Fragrance).